It’s that time of year when people tend to get sinus infections so I felt like this post was appropriate. I remember one winter when I was living in NYC, I had a severe stuffy nose. I couldn’t breathe through my nose and my friend took me to the store to get a neti pot. It saved my life. I haven’t had a nasal problem ever since. I also moved out of NYC shortly after so that probably helped too. Basically you don’t have to be sick in order to practice this nasal irrigation technique. The neti pot has been used for thousands of years in Ayurvedic medicine. It’s good to use after spending time in planes or in heated, dry or air-conditioned rooms. Smokers can benefit greatly from using the neti pot. If you are putting “things” up your nose that you shouldn’t, you should probably also consider using the neti pot. 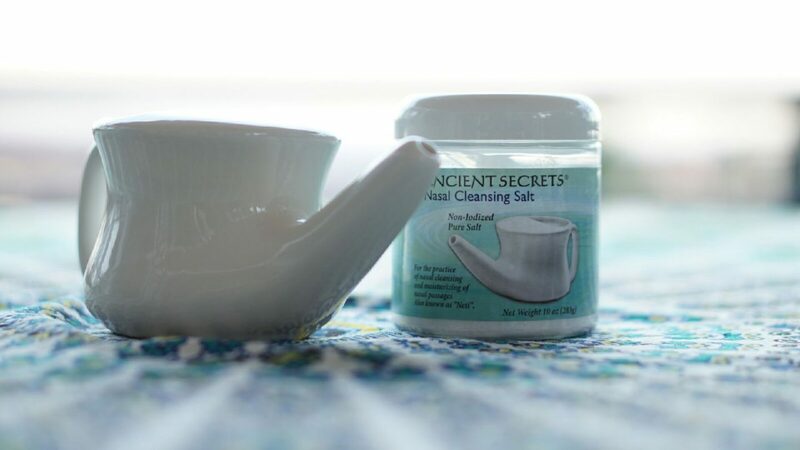 It’s been proven by scientists that the salt mixture moves mucus out of the nose faster and opens sinus passages, which is very beneficial for healthy nose activity. Purchase a neti pot. You can buy one at most convenience store like Walgreens or Whole Foods. They usually come with salt packets, but make sure. Fill the container with lukewarm water. Use filtered or distilled water. For added precaution, boil the water to kill any bacteria and wait until it’s body temperature. Add the salt solution; salt-to-water ratio is 1 teaspoon sea salt to 1 pint (2 cups) water. Over a sink, tilt your head forward so you are looking directly down toward the sink. Insert the spout into your nostril of choice. It is important that you breathe through your mouth. Turn your head slightly to let water flow through the nostril and exit out of the other nostril. You will feel the water as it passes through your sinuses. To finish, expel any remaining water by gently blowing out of both open nostrils at the same time. You can also dangle your head all the way down to make sure it’s all out. Do this in the morning rather then at night. I normally do it at night, but it’s definitely better to do in the morning as some water may remain in the nasal passages and drain down your throat when you go to bed. This happened to me and I had a cough for like a week. After you’ve done both sides try laying in Child’s Pose for a couple minutes as some remaining water may come out that you didn’t know was still in there. I read that the saltiness of the water should represent that of your tears, so it’s ok to taste the water first before irrigaton. I can tell you that if it’s not salty enough, it burns like hell. One time I did the neti pot without any solution cuz I didn’t know better and believe me it was a bad idea. You have to add the salt. I think it’s ok to use store bought solution packets. It keeps things easy since it’s one packet per fill, so you use 2 packets per time. I’ve messed around with making my own solution. I’ve tried non-iodized fine sea salt mixed with baking soda and also used my Pink Himalayan Salt in Sole form mixed with water, which is suppose to be the best. I used one of these religiously when I lived in Syracuse. “Things” hahah. I feel like I need this. Been having crazy mucus build up lately, especially when I sleep. Will definitely be tryinf this out soon. Thanks!